This is one of those dishes that you rustle up quickly when you dont have the time or effort needed to mess about making complicated dishes. Personally, I love dishes that can be prepared in as few pots as possible. This is one of them. It also turns your basic chicken legs & thighs into a delicious and warming dish and is also very healthy on the wallet. 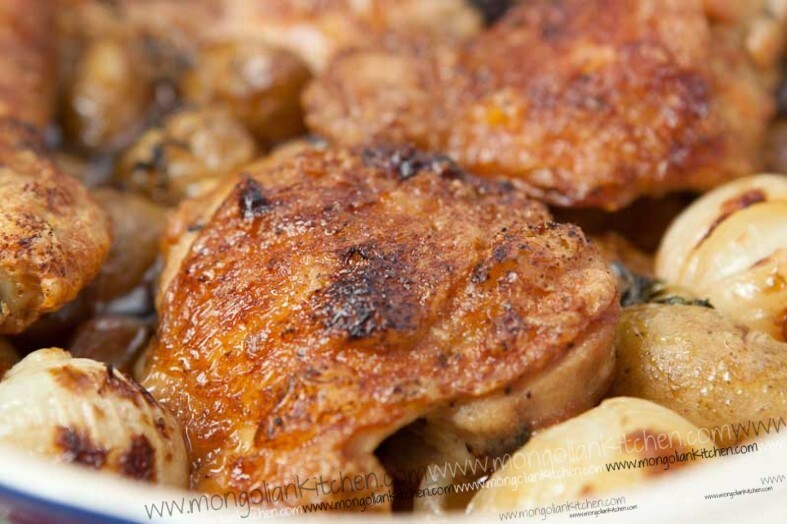 In this case we used corn fed chicken thighs and legs with new potatoes and a few shallots or small onions. Season the chicken, fry to get it crispy and extra flavourings, then stick in an oven dish with the potatoes and some stock. The other beauty of this dish is there is no real measurements needed…. you make as much chicken and vegetables as you like. The seasoning is rubbed on the chicken so that also determines how much you use. Coat the chicken in the seasoning ingredients then add a light coating of corn flour. Dust off the excess. In a frying pan heat the olive oil and butter and fry the chicken until golden on both sides. Transfer the potatoes and onions to your baking dish. Add the chicken on top (we leave the chicken sitting on the potatoes to remain crisp). Pour off some of the frying oil and butter ontop of the chicken and potatoes. Mix the stock and white wine and add to the oven dish (half cover the potatoes/chicken). Add fresh thyme (or rosemary) and place back into the oven. Reduce the heat to 180 degrees and allow to cook/reduce for 20-25 minutes or until the chicken has cooked. To serve we removed the ingredients and mixed in a little cream into the remaining gravy, then poured over the chicken.